AMES, Iowa — For the fifth consecutive year, the College of Agriculture and Life Sciences at Iowa State University has set an enrollment record. The college’s fall-semester enrollment is 5,395, including both undergraduate and graduate students. Undergraduate enrollment grew to 4,657 students, an increase of 45 students from the previous year. Graduate student enrollment is 738, which is 25 fewer than fall 2015. Over the last five years, undergraduate enrollment in the college has increased 19 percent. Over the past 12 years, since 2005, the college has had a 90 percent increase in undergraduate students. Campuswide, Iowa State’s fall 2016 enrollment grew to 36,660, the largest in school history. CALS also is graduating more students than ever, presenting bachelor’s degrees to 1,100 students in the 2015-16 school year, up from 680 graduates in the 2010-11 academic year. For the second straight year, women make up the majority of College of Agriculture and Life Sciences undergraduate students — 50.7 percent female and 49.3 percent male. Last year was the first time in history that the college had more undergraduates who were women than men. Seventy percent of the college’s undergraduates are Iowa residents. CALS has had a placement rate of 97 percent or better for 18 straight years. Nearly 72 percent of graduates begin their careers in Iowa. The college’s career fair is the largest of its kind in the nation. Last fall’s career day attracted a record 277 employers and 2,650 students, including students from 19 other schools. 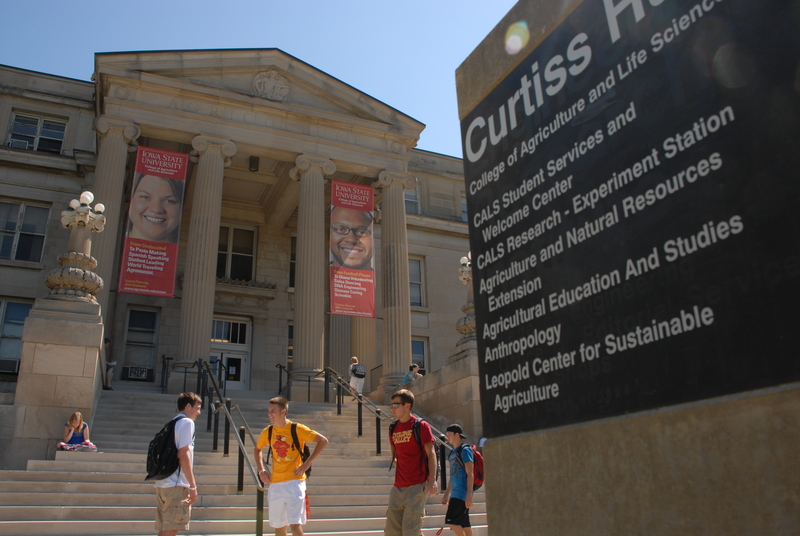 For four straight years, Iowa State has been ranked in the top 10 worldwide for university programs in agriculture and forestry, conducted by the QS World University Rankings. The college offers 27 undergraduate majors preparing students for careers spanning the study of food, environment, energy, climate, nutrition, agricultural production and business and science and technology. Curtiss Hall, base of CALS administration.